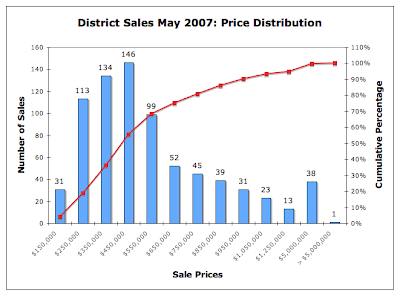 I'll post my analysis of the District's May 2007 recorded sales within the next two days. A summarization would be that in the aggregate, YoY: average prices are flat, median prices are slightly negative, and sales volume has fallen dramatically. Half the wards experienced negative growth in average and median sales prices and all but one saw lower sales volume. How to read the graphic: the bucket labeled "$150,000" represents all sales recorded at $150,000 and below; "$250,000" is $150,001 - $250,000, and so on. The $23MM Georgetown mansion is included in this graphic, the property with the extra "0" in its recorded price is not.